The third important consideration when choosing the house, is the facing. Check all the major windows facing direction on all bedrooms and living room. It is best for all major windows facing direction to be North and South. 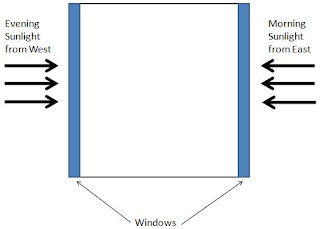 If most of the windows are facing East or West (see picture above), it will not be very good. The reason is simple, sun rises from the east and sets to the west. If your windows are facing East or West, a lot of sunlight will go into your house, making your house very hot and unbearable. Even you have aircon, is of not much of the use. Better think twice if you intend to buy such house. One more thing, make sure that the house is bright. Normally a house with a lot of windows will be brighter. House which is dark even during the noon time, will make people feel sleepy and unenergetic. So make sure you do a check during noon time to ensure that the house is bright enough.